This month we focus on two reissues recently put out by the good folks at Rhino. The Very Best of Ray Charles mines the 40-years-plus of The Genius' career, and comes up with something close to the definitive one-disc collection. Of course, someone who's had such a long and varied career as Ray Charles, not to say anything about his importance by virtue of his creating almost by himself an entire new genre of music, greatly benefits from a well-conceived boxed set. In Charles' case, there is already Genius & Soul: The 50th Anniversary Collection, also compiled by Rhino. But it's not everyone who can pay the rather large amount of money boxed sets demand, thus the need for a well-conceived single-disk "Best of ." 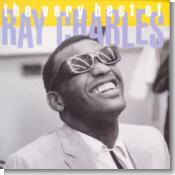 So the question is: what is a well-conceived "Best of" in Ray Charles' case? Well, you want the hits, the historically important songs. But you also want to cover as much of his career as possible so as to give an overview. The compilers at Rhino have therefore chosen to concentrate on the period when Charles was truly revolutionizing music, starting with "I've Got a Woman," the song responsible for creating a sound that mixed the blues with gospel, i.e. creating soul music. Before this recording, Charles' music, though excellent, was more derivative, firmly in the mold of Charles Brown or Nat King Cole ,or, in his early Atlantic recordings, more in keeping with the trends of early R&B. But starting with "I've Got the Blues," it was Charles who was defining the trends. All the important tracks are here, whether from his Atlantic days, including of course "What'd I Say" (the full-length album version), or from his ABC-Paramount stay, including two tracks from his Modern Sounds in Country and Western Music albums, which were so advanced for the time that they shocked the world. Rhino is, of course, well known for its Blues Masters series, subtitled The Essential Blues Collection, and who am I to argue? 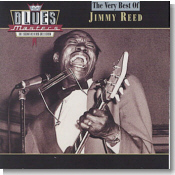 Blues Masters: The Very Best of Jimmy Reed is one of two recent installments in this ongoing series (the other one is devoted to Elmore James). The compilers (with help from Jimmie Vaughan) must have had a somewhat easier task in selecting Jimmy Reed's best music than that of Ray Charles, simply because the career of the former was much shorter than that of the latter. Still, they managed to come up with a few rarities, including "High and Lonesome," the very first Jimmy Reed record and the very first record put out by Vee-Jay, and "Odds and Ends," an instrumental duet between harmonica and violin (yes, violin) from 1957. Even if you already own a Jimmy Reed collection, chances are you'll want this one too.